Alabama Gov. Kay Ivey launched a statewide initiative to address school safety on Tuesday afternoon in the wake of a school shooting in Florida last month that left 17 dead. In the days since those students and teachers were killed at Marjory Stoneman Douglas High School in Parkland, Florida, many ideas have been discussed to ensure students are safe nationwide. Some range from gun control measures to arming classroom teachers with weapons of their own, and though Ivey’s initial “framework” for school safety didn’t endorse any of those efforts, it didn’t rule any out, either. 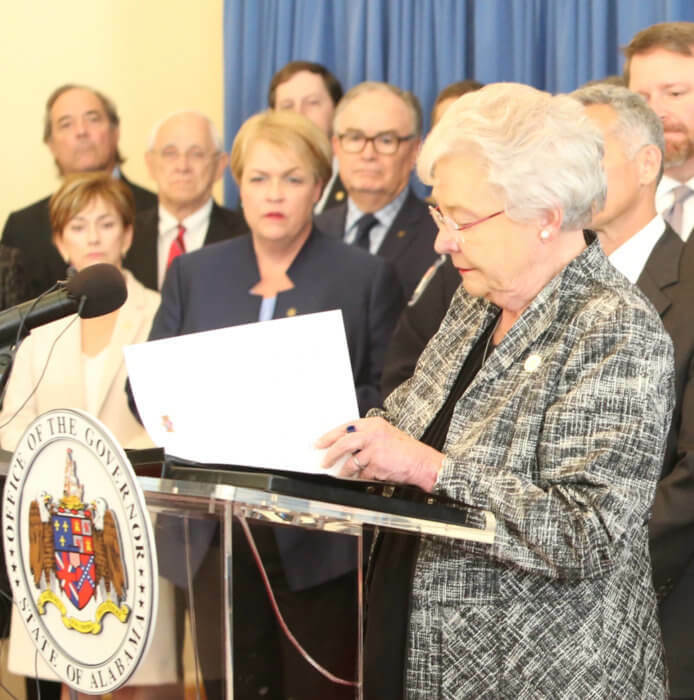 Instead, Ivey said any and all proposals could be submitted to the Securing Alabama Facilities of Education (SAFE) Council, which she created Tuesday through an executive order. The group will comprise state education, law enforcement and mental health officials and will ultimately make recommendations to the governor’s office for statewide implementation. Another component would task the Alabama Department of Education to work with school systems on “Emergency Operations Plans” for individual schools — plans that will need be updated once the SAFE Council recommendations are finalized and applied. Because each school system and individual schools have different needs, Ivey said she wants to give local school officials the flexibility to use state resources however it fits their needs. She also gave a vocal endorsement for a bill introduced by Sen. Trip Pittman (R, Fairhope) that would allow the Education Advancement and Technology Fund to be used for school security. That fund, a rolling reserve, is worth roughly $41 million this year. As for specifics, Ivey didn’t have many for reporters Tuesday, though she did briefly address questions about a bill introduced by Democratic Rep. Mary Moore that would ban certain types of semi-automatic rifles used in recent mass shootings. Another widely discussed proposal has been arming classroom teachers. A former educator herself, Ivey acknowledged it was “a different day” when she was in the classroom and said teachers during her career “didn’t have such threats” like those seen today. However, she again declined to say whether she’d support a bill arming teachers were one to pass the Legislature. Instead, she said specific proposals would have to be submitted to and reviewed by the SAFE Council before she took a position on them. Ivey said the most important roles for teachers at the moment is to identify and get help to students who could be struggling with mental health or other behavioral issues. Ivey said it is also important for law enforcement to make sure any information they receive about potential threats in public schools is taken seriously and said students, teachers and administrators would have to play a larger role in helping to identify them.